Ingredients: Cannabidiol (CBD), Hemp Seed Oil. Purchasing this product will earn you 628 Greenbucks! Cibdol 20% CBD Hemp Seed Oil is our strongest CBD Oil supplement that combines all the benefits of hemp in high concentrations, even when taken in small doses. Made from high-quality hemp and hemp seed extract. It is made from some of the European Union’s finest organic grade hemp, grown without pesticides or toxins. The CBD that is extracted from these plants is pure and effective and is easily one of the best high-end CBD products on the market today. Hemp seeds are a renowned superfood containing a variety of beneficial compounds, including plant-based protein, omega 3 and 6, phospholipids, antioxidants, amino acids, and more. By combining this oil with the power of CBD, we have produced a health supplement ideal for the daily support of a healthy lifestyle. Combining organically grown hemp with high tech modern and sterile scientific processes produces a CBD Oil lauded as one of the best. 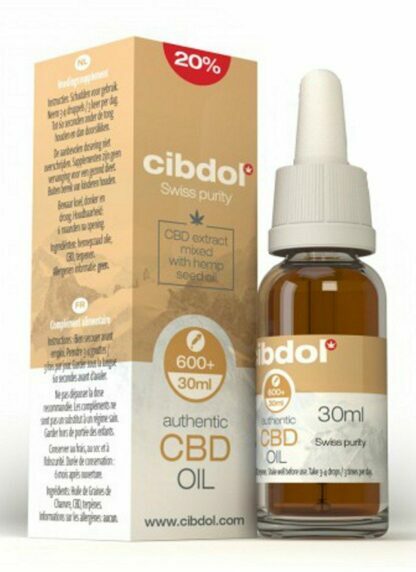 Cibdol CBD Oils are 100 per cent natural, organic, and GMO-free ensuring you a high-end product just as nature intended. CBD or Cannabidiol is one of over 100 compounds found in cannabis that belong to a class of molecules called cannabinoids. Of these compounds, CBD and THC are usually present in the highest concentrations and therefore the most recognised and studied. The form of cannabis used is industrial hemp, with high levels of CBD and virtually no THC (<0.05%). CBD is a non-psychoactive cannabinoid with numerous reported medicinal benefits. Cibdol CBD Oil is lab tested from seed to shelf for CBD content, cannabinoids, contaminants, bacteria, mould and fungi to ensure your safety and the quality of the hemp extract. CBD Content: 6000mg (20%) per bottle. Approx. 200 Drops Per 30ml Bottle. Sample Aspects: Golden brown with a mild flavour. Cannabidiol (CBD), Hemp Seed Oil. Take 1-2 drops under the tongue up to three times a day.